Two Pieces of Early Georgian Sterling Silver Tableware, London, a brandy warmer, 1737-38, by John Gamon, lg. 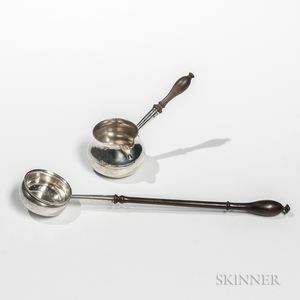 6, and a ladle, 1726-27, by William Fordham or William Fleming, lg. 13 1/2 in., approx. 6.6 troy oz.